The NoiseGuide is for use in open-plan offices and call centres. It warns staff when their noise levels are too high and likely to be causing problems. The main part lights up green to indicate that the noise levels are fine. If somebody starts to speak too loudly, or creates any other excessive noise, the NoiseGuide will light up yellow as a warning and then red. The light bar at the bottom of the NoiseGuide indicates the average sound level over 15, 30 or 60 minutes, for controlling longer term background noise levels. The NoiseGuide indicates the noise levels using red, yellow and green lights, like a traffic light. The "ear" part indicates the current levels, the bottom bar indicates the longer term background noise levels. The NoiseGuide can be mounted on a desk using the stand that is included. There are also options for open-plan office partitions and for wall mounting. It is better to monitor the noise levels within a few feet of where people are working, making it easier for them to see that they are being too loud. 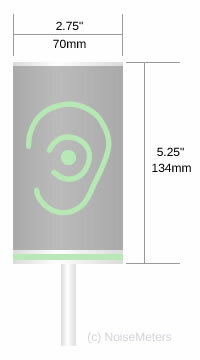 While the ear symbol shows the current noise levels, responding instantly to loud voices or other noise, the bar at the bottom shows whether the overall background noise is getting too high. This uses the average sound over last 15, 30 or 60 minutes. The NoiseGuide indicates the noise levels using red, yellow and green lights, like a traffic light. 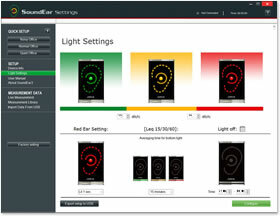 The "ear" part indicates the current levels, with green being acceptable, yellow as a warning that it is getting noisy, and red that it is too loud. The NoiseGuide can be connected directly to a computer for configuration and download. However, if the monitor is already installed this isn't always convenient. In this case you can plug a USB memory stick into the sign. It will automatically transfer all its stored measurements on to the memory stick. Similarly, configurations can be saved to the memory stick. When it is plugged into the NoiseGuide it will implement the new configurations. Noise measurements that have been downloaded via memory stick or over a direct USB connection can be viewed graphically, giving a clear view of the sound levels in the office. The NoiseGuide can be connected directly to a computer's USB port. In this case it will be powered by the computer (no need for the power supply) and the software can show current the sound level in the office. Installation of the NoiseGuide in an open plan office or call centre couldn't be easier. The most common way is to fix it to a desk using the clamp and stand included. The clamp uses a thumb-screw so no tools are required. The stand is made up of two posts, giving the option of mounting the NoiseGuide at the level shown in the image or at a lower level. The NoiseGuide itself is mounted on top with the low-voltage power cable running down the middle. The plug-top adapter is then plugged into an outlet to provide power for the monitor. The NoiseGuide office noise monitor comes with a desk stand. This can be free standing but is usually better camped to the desk as show. The clamp is also included. Power for the NoiseGuide comes from a small plug-top adapter. The low voltage power cable runs down inside the tube to provide a safe and tidy installation, as required in any office environment. An optional bracket is available to mount the NoiseGuide on top of an office screen or partition. This is the ideal position for divided offices as it puts the NoiseGuide in a visible location. The NoiseGuide fits on to the bracket, which then simply clips over the top of the partition or office screen. The low voltage power cable should then be routed down the partition and to a power outlet, using the power adapter that is included. See Options tab for pricing and availability. The order codes for the NoiseGuide kits indicate the number of signs included. We can provide you with a quotation for any quantity, but the standard order codes are SENGKx, where x indicates the quantity of NoiseGuides, mounts and power adapters. Power Supply 5VDC, max 2.5W. Micro USB.